The Epiphone ES-339 PRO is a classic ES-style archtop similar in shape to the ES-335 or Casino but with a reduced body size. The ES-339 PRO features custom wound Alnico Classic PRO™ humbucker pickups with coil-tapping plus Epiphone Deluxe Machine Heads. 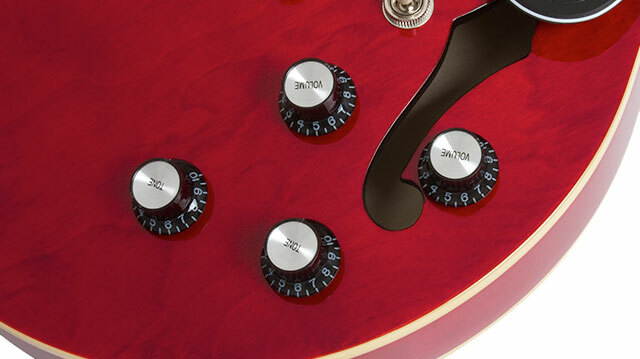 Now available in Cherry, Ebony, Pelham Blue, and Vintage Sunburst color finishes. The Epiphone ES-339 PRO features an ES-style laminated Maple body with a solid center block in a reduced size making it lighter and easier for travel. The Mahogany neck is glued to the body with a traditional Mortise and Tenon neck joint and has an easy-to-play SlimTaper™ ‘D’ profile. The Pau Ferro fingerboard has ‘mother-of-pearl’ style Dot inlays, 22 medium jumbo frets, and a 12” radius. Both the body and fingerboard have single-ply cream binding. The ES-339 PRO is available in Cherry, Ebony, Pelham Blue, and Vintage Sunburst color finishes, each with a black pickguard with metal “E”. The ES-339 PRO is powered by Alnico Classic PRO™ humbuckers made with Alnico-V magnets, which produce a slightly higher output in the mid and high ranges. 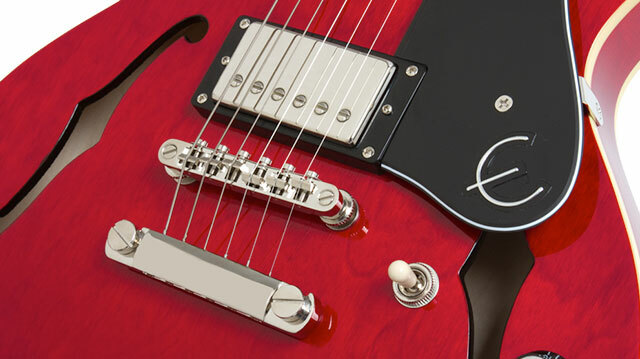 Each pickup has it own Volume and Tone control with full-size 500K Ω potentiometers matched with Epiphone’s rugged, all-metal, 3-way toggle pickup selector switch for long-lasting performance. Each pickup also is wired for coil-tapping. By pulling up the pickup’s volume knob, the humbucker will become a “single-coil” pickup, allowing players an infinite variety of tones from single-coil bark to full humbucker bite. When winding humbuckers, Epiphone utilizes a double vacuum waxing process that ensures quiet operation free from microphonic hum. The pickup is first placed in the specialized wax vacuuming system before the cover is placed on the unit to ensure that the wax fully penetrates to the very center of the pickup and solidifies all parts. After the cover is placed on, it is again given a second vacuum wax bath until the unit is completely saturated with wax. Epiphone also uses high quality ABS plastic bobbins, 1010 Cold Rolled Steel pole shoes and pole screws, the finest magnet wire available. The ES-339 PRO comes with Epiphone’s legendary LockTone™ bridge and Stopbar tailpiece for incredible sustain and superb intonation along with Epiphone Deluxe machine heads with a 18:1 tuning ratio, nickel hardware, and an Epiphone 1/4" Heavy-Duty output jack. A hard case is available for purchase at Authorized Epiphone Dealers. The ES-339 PRO comes with Epiphone’s Limited Lifetime Guarantee and Gibson’s world famous 24/7/365 Customer Service. Visit your nearest Authorized Epiphone Dealer today to discover the ES-339 PRO at an Authorized Epiphone Dealer.